Little pieces of the stars and earth happily dance around your heart giving you ever-so-slight-a-nudge to celebrate who you really are. 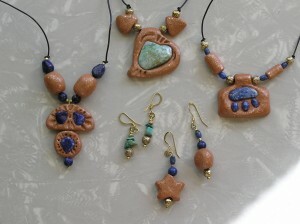 Hand formed micaceous pendants are embedded with lapis or enhanced turquoise stones. Micaceous beads are hand rolled and strung with accent beads on a strong, light cord. This wearable art is created in my studio, along Arroyo Chamiso, beneath the Sangre de Christo Mountains, in Santa Fe, New Mexico.